This art library tourism gig has led to many amazing repositories around the world, full to the brim of extraordinary goodies and interesting methodology. It has also highlighted the lives and work of some truly extraordinary people, the builders and keepers of these collections. So an ArtLibraryCrawl focus on/biographical spotlight of these folk seems in order. Wowed by the Judith A Hoffberg Artist Book Collection at UCLA Arts Library (artlibrarycrawlposted here), I was equally impressed by the accomplishments of the late, great Ms Hoffberg, an extraordinary librarian, writer, curator, editor, publisher. Co-founder of Art Libraries Society of North America and champion of small press publication, xerox art, mail art and book art. Soak up her bio here and here. Continuing this spotlight, a quick word on the Oscars library's namesake Margaret Herrick. Margaret Herrick (then Gledhill, nee Buck) was the librarian wife of one of the earliest Executive Directors of the Academy. She stepped in very early in the Academy's history to take on the fledgling library, performing her work in an unpaid capacity for a number of years. No need to insert feminist discourse/commentary here. She ran the library formally through the 30's and early 40's. In an excellent take on Rosie the Riveter, Ms Herrick was asked in 1943 to take over the running of the Academy when the US entered the war and her husband was called up for service. However, when the boys came home she stayed on in her role (Mr Gledhill didn't get his job back, or, in fact, his wife- Margaret remarried in 1946, taking the name Herrick). She remained the Executive Director of the Academy of Motion Picture Arts and Sciences into the 1970's. Upon her retirement they named the Academy Library after her. Other dedications: she is widely credited with the sobriquet "Oscar" after she mentioned the statuette awards looked "just like my uncle Oscar". Her legacy doesn't end there. Not only did Margaret guide the Academy through decades of film industry development and change, she was also the instrumental to the Academy's (and therefore the Library's) sound economic footing. 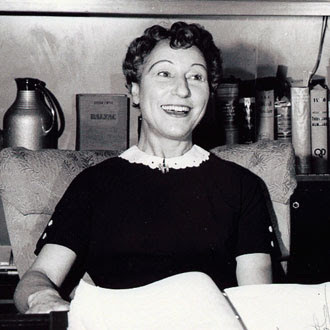 By driving the sale and negotiation of television rights to the annual Academy Awards she ensured the economic strength and longevity of her organisation and its extraordinary library. Margaret Herrick: Librarian, Hollywood mover/shaker, artlibrarycrawl maven/doyen #2. Current Library Director Dr Linda Mehr describes Margaret Herrick as a "strong woman". I bet she's right. Linda is no lightweight herself. Lookout Linda Mehr, you are next in my celebration of impressive Librariana.